You have those random moments where you start looking back at an earlier part of your life, and then either laugh or cry at what you have done at that point of time. It happens to me all the time, but yesterday night, while deep in my thoughts, I thought I could share it with my readers this time. Whether you just like reading, interested, or needed this, I hope you get the point of this post in the end. 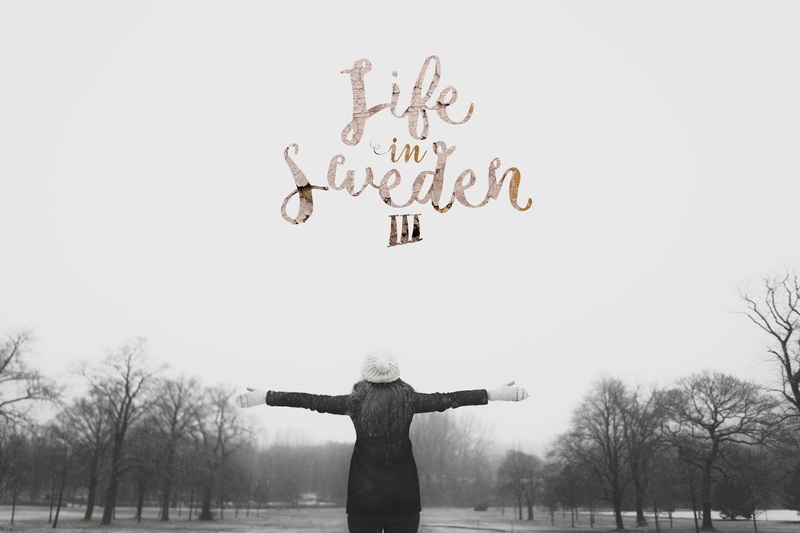 Last night, I rethought of my previous blog post 'How's life in Sweden' and I'm suddenly so sorry how shallow I made it sound like living in Sweden. Like what a typical welfare leech would blog about. Maybe at that point of time, I really wasn't living here long enough (and also still wasn't certain if we would be living here for good, with no home of our own yet) to be experiencing what I am about to blog about now. Now, my little family have our own little 95.5 sqm rented home, monthly bills to pay, groceries and home necessities to buy once or sometimes even twice a week. And I started to experience the full winter here. Then it hit me, that living in a foreign country is not always a bed of roses, wherever you may choose to go. The winter made me really depressed and frustrated with living here. Don't get me wrong, it is not the season itself (winter is a really beautiful blue season), but more of the harsh weather conditions in contrast to Singapore's that I have to face. It wasn't mentioned in the previous post stated as I wasn't experiencing it yet, all the physiological changes. My skin constantly felt dry and tight, with acne popping on my forehead frequently due to the extremely dry condition, despite applying moisturizers. And it was especially tight and painful around my mouth and right below my nose. My scalp, also because of being too dry, started to shed more frequently, making me look like I have dandruff, when it's really just dry scalp. (Yes, there is a difference, you can read about it here.) It just isn't attractive? My hands and shins are so dry that my hands get abrasions and cuts easily whenever I accidentally scraped them against something. My shins look like snake's skin. Other than these appearance changes, I also had blood in my sputum and mucus every single day. Sometimes fresh red blood spurts out when I blow my nose or when I try to clear my throat and spit into the sink. And dark red blood in dried mucus that is difficult to clear from my nose. Oh and the annoying wet runny nose whenever I'm out or sometimes even at home. Besides affecting me, my son also have very dry, red cheeks, arms and legs which got very itchy so he kept scratching them causing lots of scratch marks everywhere, it looked like he got abused or something. It's only slowly getting better now after I got a Vicks vaporizer to increase the humidity in our home. Aside from that, I am 5,978 miles away from my family and friends. I don't speak Swedish, have no idea how to approach someone to make friends with them because of the language barrier (they do speak English here but I thought it's quite rude to want to make friends with a Swede but can't speak their native language), I don't have a driving license here and it's so freaking cold and dark to be walking for long outside. All I can do is stay indoors with my son most of the time. Or even if I do go out, it will just be with my son, to walk around town aimlessly, buy some groceries from the supermarket, then home. I may be very free, but what's the point of being free if there's no one to hang out and spend time with? Who wouldn't be depressed in such a situation? Out of desperation, I took it to a Singapore Community in Sweden FB group to ask fellow Singaporeans if they experienced the same and how they coped/is coping with it when they initially moved here from Singapore. And there, was the good that came out of the bad. Because of this, I understood that I am not the only one experiencing it, and that it is a passing phase. And also because of this reaching out, I got to know many fellow Singaporean friends living in Sweden. Some of them even took the time and effort to send me packages to encourage and help make my life here a little better. They have also shared many information, recommendations and recipes that would be useful in Sweden. Heck! We might even be having a Chinese New Year gathering soon! And then... everything became clearer to me and I started to appreciate things around me more. Who wouldn't appreciate their life when they have a cozy and blessed home of their own, abundant food on the table (not to mention mostly organic), being able to go to bed at stupid o'clock and get up at stupid o'clock as quoted by my husband LOL, being able to stay at home with my baby and more than survive with a single income (which I would probably never be able to enjoy back in Singapore if we were to have a home of our own, having to pay monthly bills and buying groceries every week), having an understanding husband who would buy me clothes / shoes / electronics now and again, letting me have his card when I want to go shopping (but I always end up not buying much because I have learnt to become a budget barbie and spend only when an item is on sale or I feel it's worth it haha), having an amazing family back in Singapore who has only become more loving and caring towards us ever since we moved, having a great and lovely MIL who would bring us around in her car to shop, have fun and prepare delicious meals, a loveable GMIL who dotes on our family as well, having friends planning to come visit at some point and the list would go on, if I keep learning to appreciate life as it approaches me. Additionally, after I study Swedish and the higher level of Swedish, in years to come, I can choose to study in a Uni here as well, and it's free. I also get a monthly allowance from the government when I study! Better to be embracing this life instead of deploring! Am I right? "You can change the path of your life from dark to light or from negative to positive. Every single time you focus on the positive, you are bringing more light into your life, and you know that light removes all darkness. Gratitude, love, kind thoughts, words and actions bring light and eliminate the darkness. Fill your life with the light of positivity!" So I've started this post negatively and ended it positively. I hope if you have any negativity at all, that by the end of this post would be turned positive as well. Another point I want to make in this lengthy post is that, do you ever look a few years back and laugh at something you did / did not do back then? Although easier said than done, try to look ahead of life, and if it helps, put yourself in the shoes of the future you, a few years down the road. Would you be laughing at what you're doing / not doing now? After last night's deep thinking, I am now grateful for the life I'm living.